Veterinary Cardiac Ultrasound, Echocardiogram, is an examination of the heart. An echocardiogram is a non-invasive technique that allows visualization of the internal structures of the heart (valves, muscle, and blood vessels) as well as the structures adjacent to the heart (great vessels and pericardium). Currently, cardiac veterinary ultrasound is the best method of determining causes of heart murmurs and rapid changes in the size of the heart. 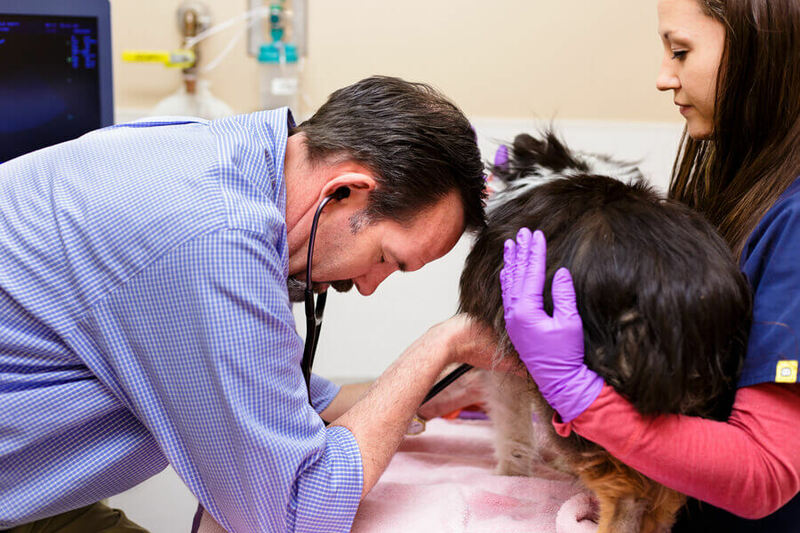 Patients receiving veterinary cardiac ultrasound will have a small portion of hair removed from under the right arm and are placed with their right side down on an elevated table. This positioning provides the best view of the heart. In critical patients, the study may be done on both sides of the chest and in a standing or sternal position. In some cases, other structures may be viewed with diagnostic ultrasound including fluid accumulation outside of the lungs, some tumors associated with the heart or lungs, and tumors outside of the heart and lungs, but contained within the chest cavity. Pericardiocentesis. This procedure is used to remove fluid that has accumulated within the sac that surrounds the heart (pericardium). Usually, this fluid is produced because of a tumor on the heart causing irritation and subsequent fluid accumulation. Alternatively, it can be caused through benign processes. This procedure carries some risk of cardiac arrhythmia and can be life-threatening, but persistent severe fluid accumulation can be equally serious. Fluid samples are often sent for pathology review and culture. Placement of chest tubes. In pets with persistent fluid or air accumulation with the chest cavity that quickly returns following thoracocentesis, chest tubes may be required. This procedure involves placement of tubes into the chest cavity that can remove fluid and air under constant suction. This procedure requires extended hospitalization and may require surgical intervention if the problem does not resolve within several days. Fine needle aspiration cytology. (See Anicillary procedures with abdominal ultrasound). Ultrasound-guided biopsy. (See Ancillary procedures with abdominal ultrasound).